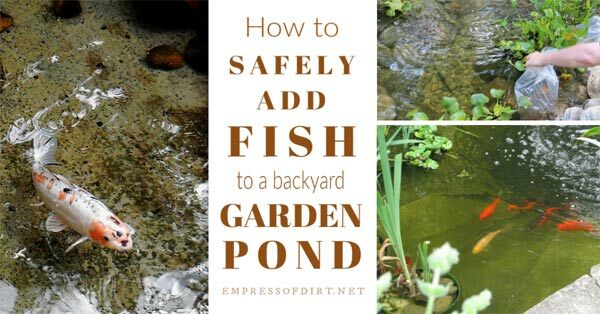 Ready to add pond fish to your backyard garden pond? To ensure the fish and pond stay healthy, there are a few things to know first. 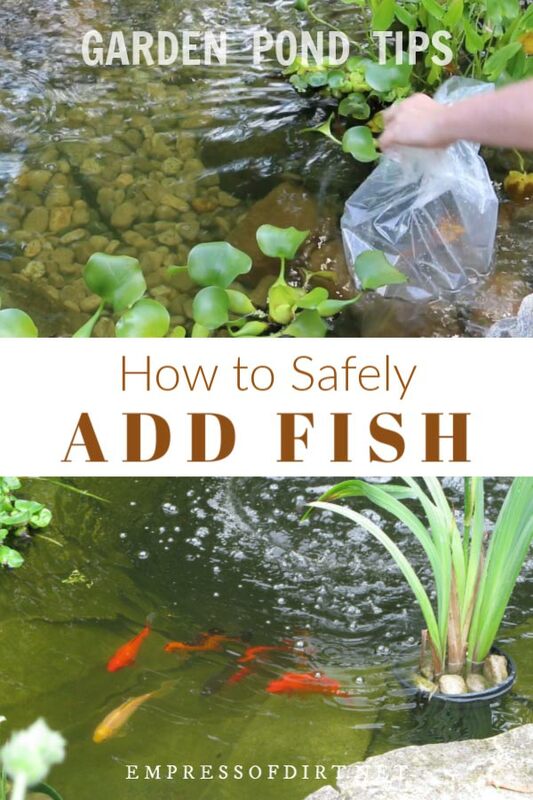 I’ll walk you through the preparation checklist, and then show you how to safely introduce coldwater fish, including goldfish and koi, to their new home. 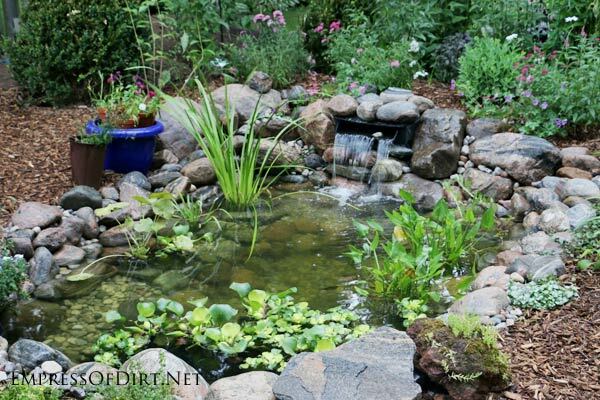 This is part of series on building and maintaining fish ponds: 20 Backyard Pond Ideas for all budgets. The first thing to know about garden pond fish is, they are pets and dependent on you for their health and safety. With proper care and the right conditions, they can live for many years but they do require consistent care and attention to conditions in the pond. 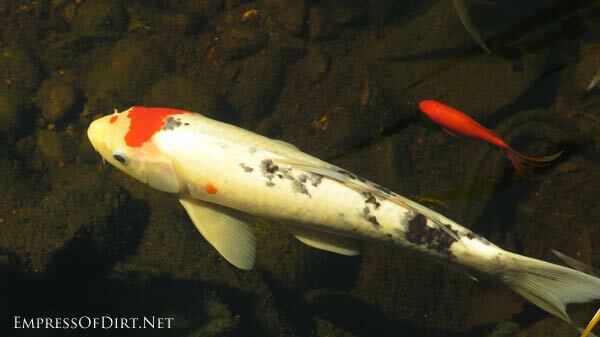 While goldfish may have shorter lives, large koi can live 20-30 years or more, and there are reports of some living longer than 200 years, passed along from generation to generation. So, just like any family pet, be prepared for a long living companions that could potentially out-live you, or, to keep it real, be snatched away by a predator. I recently added a new pond to our backyard and, after a few weeks of preparation, also added some pond fish. I’ve also got other fish in a smaller pond that are now five years old and doing just fine so I’m hopeful for these guys too. To ensure fish adapt to their new habitat, there are some steps to take, both before ever buying the fish, and then when introducing them to your pond. 1. Is my pond ready for fish? 2. How many fish can I have? Here are some things to consider before adding fish to your garden pond. 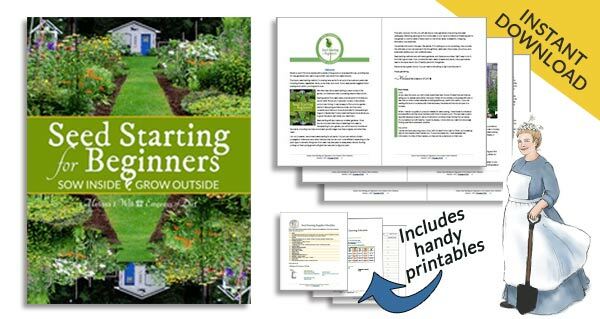 The goal is to keep everything—the fish, water quality, plants, and other pond life healthy. For starters, the pond needs to be healthy, with enough water volume, depth, filtration, aeration, and circulation to provide a good habitat for the fish all year-round. If you live in an area where predators are an issue, fish are probably not a good idea, unless you’ve got some known solution planned to keep the fish protected from diving herons and grabbing raccoon hands. In a cold climate, cold-water fish like goldfish and koi are over-wintered in the pond. This means the conditions have to be right both in the heat of summer and the cold of winter. Coldwater fish go dormant as the temperature drops and stay motionless near the bottom of the pond. Our job is to ensure the water does not freeze and ensure an open air hole on the surface. A water depth of at least 24” for goldfish, and 24-36” for koi is recommended. I have also successfully housed goldfish in a pond that was just 18″ deep by keeping the water moving with a pump on the pond floor throughout the winters. A recirculating pump will keep an area of the pond surface from freezing to allow sufficient air flow. The pond water should be free of or within safe limits for chlorine, ammonia, phosphates, and nitrites. You can get all-in-one Pond Master Liquid Test Kits to check these levels. I have not tried one myself but the reviews seem to indicate they reliable. They also come with pH testers so you can check if you have the desired range (between 7.2 and 7.8). If you filled your pond with tap water, it will need to be dechlorinated before adding fish. There are commercial de-chlorinators to speed up the process or, you can allow at least a week for the chlorine to ‘off-gas’ on its own. Also, tap water is often very cold. A temperature of 60f (15C) or higher is ideal before adding fish, and not more than 15-degrees different than the water the fish are accustomed to. I’ve outlined below how to gradually introduce them to their new environment to avoid shock. Your pond habitat should include a variety of hardy aquatic plants to provide shelter, hiding spots, and food for the fish. Aim to have approximately 60% of the water surface covered in plants. You can see the list of pond plants I have listed here. Natural algae and other crud will form on the pond rocks and plants. This is normal and necessary to support life in the pond. And finally, don’t be hasty. It’s fun having a new pond and we may rush to add fish before everything is truly ready. 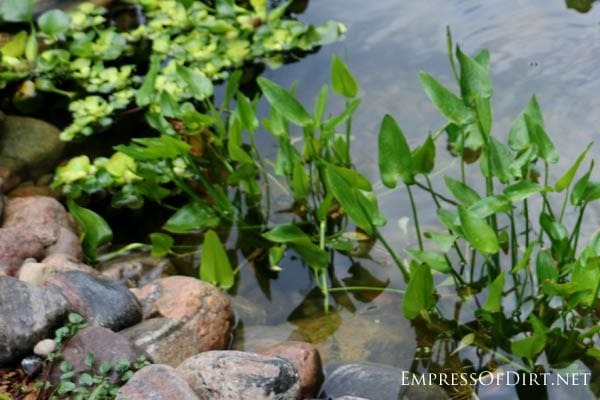 If you have checked everything listed here, the last step is to wait until your new pond has been running a few weeks and started to naturalize, looking more like a pond, with some green forming on the rocks, and not like a pristine swimming pool. You need life in there for this to work. There are many different formulas and opinions about this. I choose to go with common sense, conservative estimates, and long-range planning so the fish have plenty of space to move, play, and grow. I’ve listed some examples below. Both of these are members of the carp (Cyprinidae) family though different genus and species. Goldfish including various comets, black moors, shubunkins, and fantails. Koi – available in all sorts of colour groups and patterns. Sometimes known to be rowdy in ponds, eating plants, and knocking things over, yet loved my many. I’ve also seen minnows, mosqitofish, and sunfish in backyard ponds. Overcrowding with fish can both compromise the health of the fish and the overall health of the pond, resulting in fish deaths and gross, murky water. Also, as with any living thing, there may be unexpected losses as well as additions. Some fish will die. Some fish may reproduce, giving you far more fish than you anticipated. In this case, you may need to find homes for the extras. The maximum number of fish is determined by the pond size (surface water volume and depth of pond) plus the oxygen available which increases if the pond has good circulation with a pump and filter. Plan for the needs of mature, adult-size fish, not the wee babies you will probably be buying. Some fish calculators use adult fish-length as the measure, which seems fine for long, slender goldfish. Others use the average weight, which makes more sense with a bulky fish like a koi. To keep this simple, follow the formula below and then adjust for fish bulk if applicable. A pond that measures 8×11’ has 88 square feet of water surface. If the koi you want are the domestic type that get to be about 12” long, that means 12 square feet of pond surface is suitable per fish. In 88 square feet you could have approximately 4 adult koi (12” long) or 14 six-inch adult goldfish. A pond with a water area of 8x11x2-feet deep has a total volume of approximately 1317 gallons. In this example, the pond could accommodate 3 koi or 13 goldfish, or a combination such as 1 koi and 9 goldfish. When you are ready to buy, find a good garden pond shop, preferably one that sells both fish and plants, and get their advice for your particular setup. So, your pond is healthy and ready and you have the right amount of fish (not too many) for the space available. There are two steps for adding fish to avoid shocking them. The key is to make this transition as gentle as possible. I’m assuming you have purchased fish from a good quality shop and you have them in a large plastic bag with a good amount of air inside and nice tight seal or elastic holding the whole thing closed. This first step gradually changes the temperature of the water the fish are in now (in the bag) to match the temperature of the pond water. Be quiet and gentle to avoid scaring or stressing the fish. Float the bag of fish on the surface of the pond for at least 30 minutes or until the two water temperatures are very close or the same. Be sure to keep the fish bag out of direct sunlight to prevent overheating. 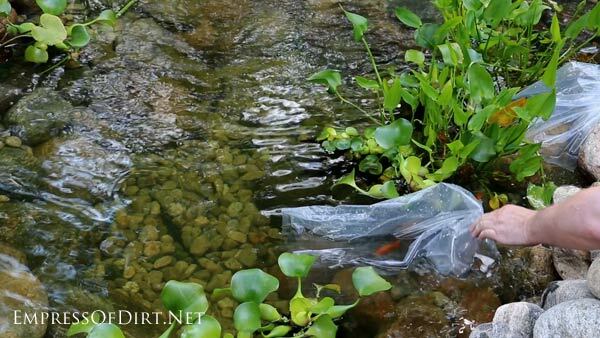 You can place a towel over the bag if you don’t have a shady spot in the pond. 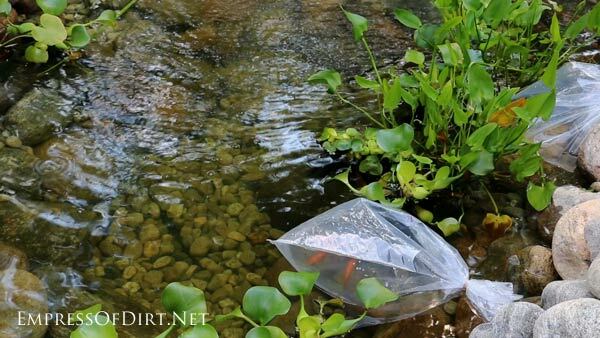 The next step is to gradually introduce the fish to the new pond water by adding some into the fish bag, allowing it to mix with their home water. If you haven’t dechlorinated or ensured safe levels of ammonia or nitrites, this could be fatal to the fish. 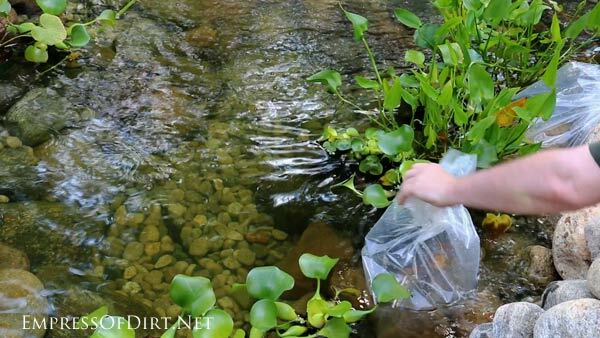 With some pond water introduced, close up the bag tightly with a good amount of air inside, and again float it, out of direct sun, on the surface of the pond for 15-30 minutes. After this time, if everyone looks happy, it’s time to release the fish. Your water temperatures are unified, the fish have been introduced to the new water and seem alert, perky, and fine. This means you can release them into the pond. Make sure it’s quiet and there are no loud noises like lawnmowers in the background. Find a comfortable place to kneel down. Open the bag, gently lower it into the pond, allowing pond water to flow in and the fish to swim out.Be free, little fishes, be free! Over the next weeks and months, your fish will start to recognize you and trust you as you visit the pond each day. Enjoy your fish! They become lovely garden pets. Advice For Starting A New Garden Pond| Good advice for getting started. DIY Build a Garden Pond in a Raised Bed| Excellent option when you don’t want to dig! Enjoyed your fish pond info. I have had a 250 gallon pond for 16 years. I had 5 Koi that got to about 1 ft long although some where just squat and fat. I float a tank heater in my pond through the winter months and keep a pump running with all the hoses off so it just circulates. I lost all my Koi with a raccoon showing up about 5 years ago. Now they are gone I have reintroduced 2 large Koi and 5 small koi. They are very skittish and I have put a large flat rock in the middle for them to hide under. I will cover the whole pond this winter with strong wire mesh. I hate to do this but it will keep predators away!! 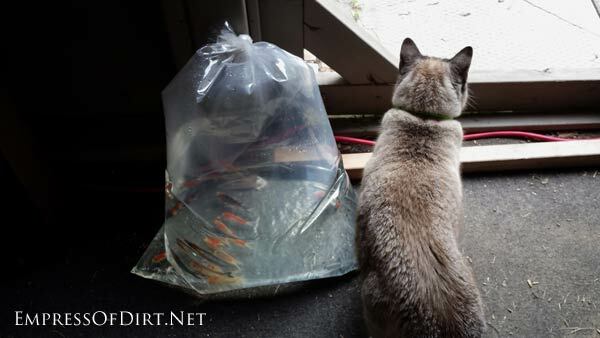 Your pond looks fabulous….